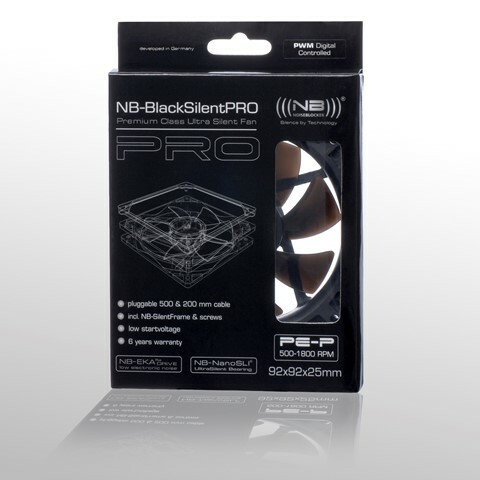 Developed with and for the discerning customer, the new (((NB))) Premium fan series, equipped with a classic frame and blade, connects the NB-BlackSilentPro series current high tech in a proven design. The high-quality NB-EKA Plus II drive and the near-silent NB-NanoSLI bearings ensure an exceptionally low noise level and the long term. Both features, which are now usually only in the context of complex multi-frame reference series used. Besides the stylish design in black matte and glossy are the BlackSilentPro fan with an individually extendable cable management and an NB-silent frame features silicone gasket and mounting hardware for the vibration and tool-free assembly . quality developed in Germany! MTBF (25°C): 180 000 Std.